Norplex-Micarta has developed materials to meet the needs of various customer specifications over the years. 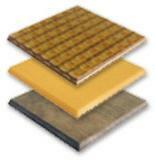 In some cases this requires a specific resin formulation on a unique substrate material to accomplish the desired results. Often these specifications are proprietary to the customer, and Norplex-Micarta takes the confidentiality of these customer constructions and systems very seriously. In addition, Norplex-Micarta has an ISO certified laboratory on site and an experienced staff of engineers and technicians capable of working with customers to characterize and/or customize a specification or a composite material for a new or highly technical application.